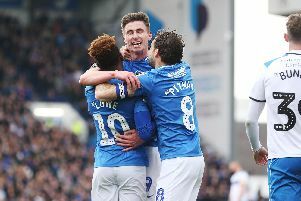 KYLE BENNETT vowed he can handle the pressure of being Pompey’s creative force. The Blues attacker believes he can continue to rise to the demand of opening up League Two opponents this season. Bennett has made an impressive start to life at Fratton Park after arriving from Doncaster this summer. Hopes were high over what the 24-year-old could produce and were raised with two goals and a star showing on the opening day against Dagenham & Redbridge. Bennett’s form hit a blip against Morecambe on Saturday as Pompey stuttered. But he shone again for long spells against Reading on Tuesday in the Capital One Cup. Bennett feels he has the conviction not to let a quiet performance, like last weekend’s, affect his belief. He promised that wouldn’t deliver a halt to him trying to carve sides open. Bennett said: ‘I love the fact the fans think I’m that kind of player. ‘It’s great. I like to deal with that pressure. ‘A bad performance last Saturday isn’t going to change my mindset on that – and hopefully it doesn’t change their mindset. ‘I will come out every game, give my all and try to create things for the team. ‘You know when you’ve played well and you know when you’ve played badly. ‘You have to be critical of yourself but at the same time get on with it. One bad performance doesn’t reflect the player you are. ‘People may get on your back – but you have to be positive minded and go out there and show what you can do. ‘No one wants you to go out on the pitch and play badly – neither do I! Pompey now go to Luton on Saturday looking to return to winning ways after a draw and defeat. The comeback nature of the Morecambe game and enthusiasm over the Reading performance ensures the team will take impetus to Kenilworth Road, though. Bennett said: ‘In the first half on Saturday we were all under par. ‘In the second half I don’t think that I had the greatest game. I created a few chances from crosses but that’s all I did. ‘My general play was not up to scratch – and I know that. ‘But there’s no point in beating yourself up about it, it’s gone. ‘We drew the game, didn’t get beat and it’s on to the next one. ‘You have to show a positive reaction and I think that was the case against Reading. ‘We came up short but the effort, determination and attitude was all there. ‘We had a go against Reading, I’ve ran around worked hard – and now it’s about Luton.